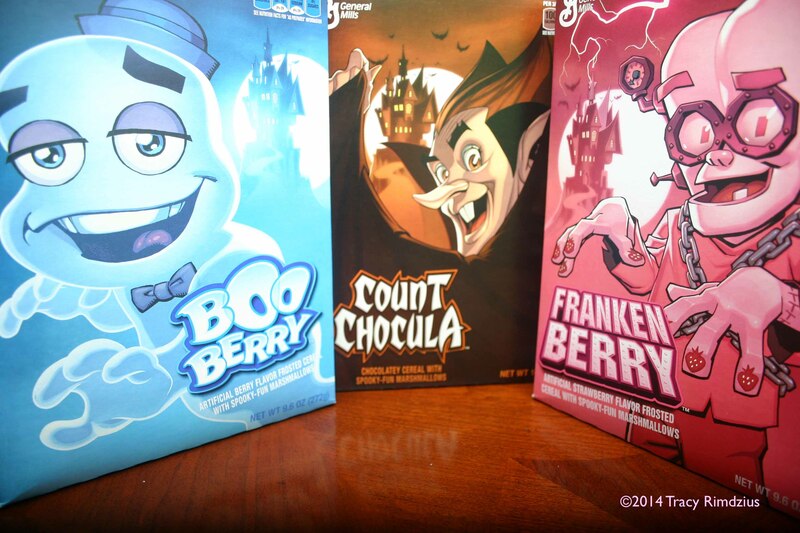 Even though I grew up eating sugary cereals in the 70s and 80s, I never tried Count Chocula, Boo Berry, or Franken Berry. When I started thinking about making cereal-flavored ice cream, some friends suggested the monster cereals. Through their reminiscing, I learned that there had been monster cereal flavors I never even knew about before: Fruit Brute and Fruity Yummy Mummy. Sadly (?!? ), those two flavors were brought back last fall only to be given the axe again this year. 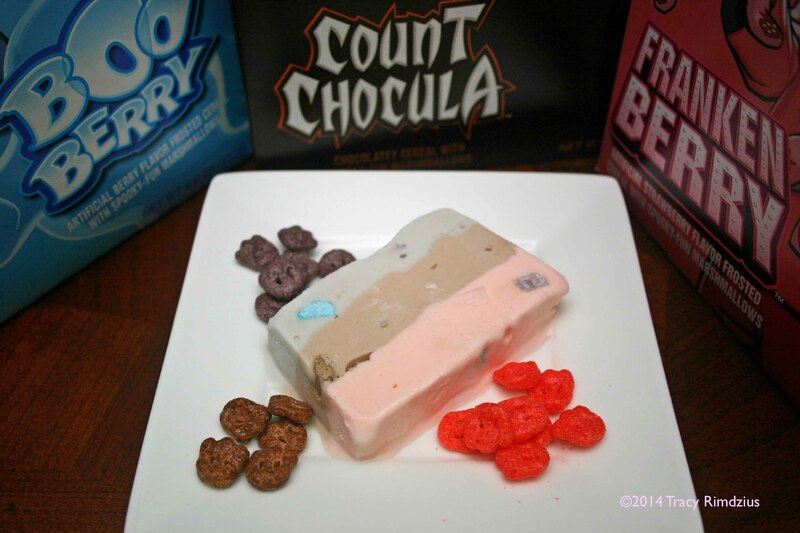 I thought it would be fun to make an ice cream terrine using all three monster cereals for Halloween, a monster cereal Neapolitan if you will. I thought the different colors would look cool…plus I couldn’t choose just one of these guys to make ice cream from, could I? When the seasonal display of monster cereals finally arrived at the grocery store, I excitedly brought them home and proceeded to open them up and try some. This was my first taste of any of them, and I was disappointed. Count Chocula was OK, but neither of the berry flavors tasted like much of anything. By this point, I’d already purchased two boxes of inedible cereal so I decided to go forward anyway…at least the ice cream terrine would look cool (I had envisioned a bright pink layer, a bright blue layer, and a brown layer). When I saw the dark grey color of the Boo Berry, I started to get concerned. I soaked a few pieces of the Boo Berry cereal in some milk for an hour to see what kind of color it would yield and the result was nada, nothing, not even a grayish tinge. But by this point, I’d already painstakingly separated the cereal from the marshmallows so I was still committed to making the ice cream terrine. I was pleasantly surprised at the result, which is great considering how time-consuming making an ice cream terrine is. All of the flavors have a distinct color (although I wish the Boo Berry were more blue), and the flavor is pretty good too (the ice cream tastes better than the dry cereal). I add an egg yolk to many of my ice creams, but left it out of these to ensure the best color. The list of ingredients below yields one flavor. Repeat two more times for the remaining two flavors. I find ice cream terrines considerably easier to remove from silicone loaf pans than regular metal pans. If not using a silicone loaf pan, line the pan with parchment paper before adding the ice cream to make the terrine easier to remove. No matter how cold the terrine is, it will smush when slicing. I suggest slicing across the layers (lay the terrine on its side) rather than from top to bottom, that way all the layers smush equally. This recipe (made once for each of the three flavors) yields about 1 quart of ice cream, enough to make two ice cream terrines (in the silicone pans above) plus about half a pint of each flavor. A 10.4 oz. box of monster cereal contains about 9.4 oz of cereal pieces and 1 oz. of marshmallows (which is SO not enough marshmallows, General Mills!). For each of the three ice cream flavors: Place a fine-mesh strainer over a large bowl containing the separated marshmallows. Heat 15 oz. whole milk and 12 oz. heavy cream to 175 degrees in a 4-quart or larger pot. Remove from heat and stir in the reserved cereal pieces. Cover the pot and let the cereal steep in the dairy for an hour. Strain the cereal from the dairy, squeezing to extract as much of the cereal-flavored dairy as possible. Discard strained cereal. Weigh the remaining cereal-flavored dairy, place it into a 4-quart or larger pot and replace the amount of dairy soaked up by the strained cereal, in proportion to the original amounts of milk and cream. In a small bowl, whisk 1 oz. milk into the cornstarch with a fork until smooth. Add the evaporated milk, sugar, and corn syrup to the cereal-flavored dairy and bring to a boil over medium-high heat, stirring to avoid scorching. Keep at a low boil for a couple of minutes, then remove the pot from the heat and gradually whisk in the cornstarch slurry. Bring dairy mixture back to a boil, stirring with a spatula for about one minute or until the mix slightly thickens (when the slurry has done its job, the mix will coat the spatula rather than run off immediately). Strain the mix into the large bowl with the marshmallows and stir to dissolve. Chill the mix in an ice bath until about 45 degrees or cooler. Churn the first flavor in an ice cream machine, adding about one-half cup marshmallows during the last minute of churning. Put about 12 oz. of the first flavor straight from the machine into each of two loaf pans, spread into an even layer, cover the top with a layer of parchment and freeze for at least one hour. When the first layer is frozen, churn the second flavor, remove the protective parchment from the first layer and add the second flavor, spreading into an even layer. Replace the parchment covering and freeze for at least one hour. Repeat this process for the remaining flavor and freeze for at least four hours before removing the terrine from the pans and slicing.